Mani Ratnam’s OK Kanmani, released last week on the 17th of April has been well received by the audience. 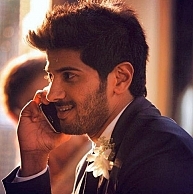 The film’s youthful leads Dulquer Salmaan and Nithya Menen, A R Rahman’s music and PC Sreeram’s cinematography have added up to the plus points of the film along with the contemporary, energetic screenplay of the legendary director. People who watched the film also loved the performance of the elder couple played by Prakash Raj and Leela Samson. In the film Ganapathy, the character played by Prakash Raj, is the doting and caring husband of Bhavani played by Leela Samson, who is diagnosed with Alzheimer’s, a condition which is characterized by memory loss, becoming severe slowly, interfering with simple everyday tasks. The way Prakash Raj loved and cared for his wife, touched many a heart. In the released film, there was no character of a son to this elderly couple. But it has come to our notice that there were portions shot of Ganapathy uncle and Bhavani aunty with a son, who drowns and dies at a young age. Later the segments were edited out to make the screenplay better and more taut. The result is of course much evident as the audience has enjoyed the film well enough to give a strong thumbs up! Where Did Director Shankar Watch OK Kanmani ? People looking for online information on Dulquer salmaan, Leela samson, Mani Ratnam, Nithya Menen, OK Kanmani, Prakash Raj will find this news story useful.